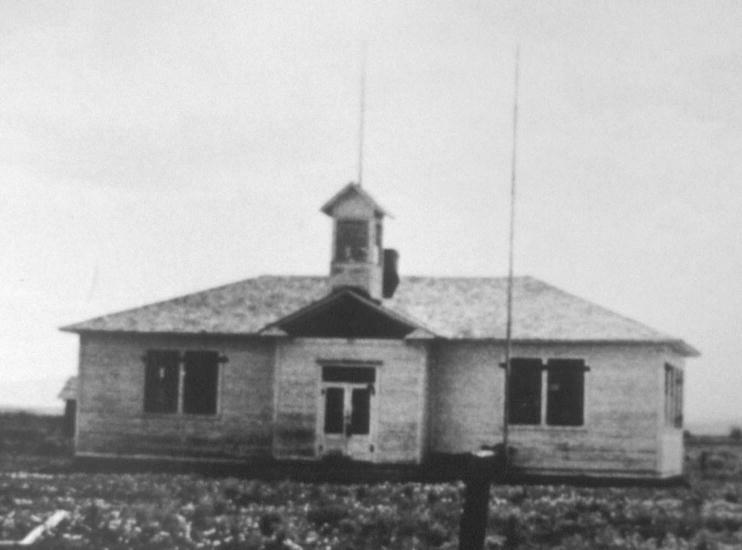 The Daniel School is an early 20th Century rural school that represents education in an isolated, sparsely-populated ranching community. The Daniel School was built in 1920 and was used until 1939 when School District No. 8 was combined with Pinedale School District No. 1, and students were then transported to Pinedale for classes. In 1936 it had twenty pupils' desks, two teachers' desks, blackboards, a library, a coal stove for heat, individual drinking cups for water, artificial lights, and swings and seesaws in a fenced playground. The Daniel School was constructed in 1920 by A.F. Atwood, General Contractor and Builder, from Big Piney, Wyoming. It is located on the western end of the small town of Daniel, on a level plain between the Green River to the north and Horse Creek to the south. This is an area rich in history, the location of several of the historic Green River Rendezvous that took place in the early 1800s. At the time the school was built, the county was sprinkled with a small number of large ranches spread out over large areas. Providing the children of Sublette County an education presented a unique challenge due to the poor transportation and long winters. As a solution, numerous one-room schools were created to serve a few nearby ranches. Classes were often held in bunkhouses or other adapted buildings, or in small one-room log schools that could be easily moved from one location to another as needed. As the region became more settled and the towns began to grow in population early in the 20th century, more substantial permanent school buildings were built to replace the early log or frame one-room schools. 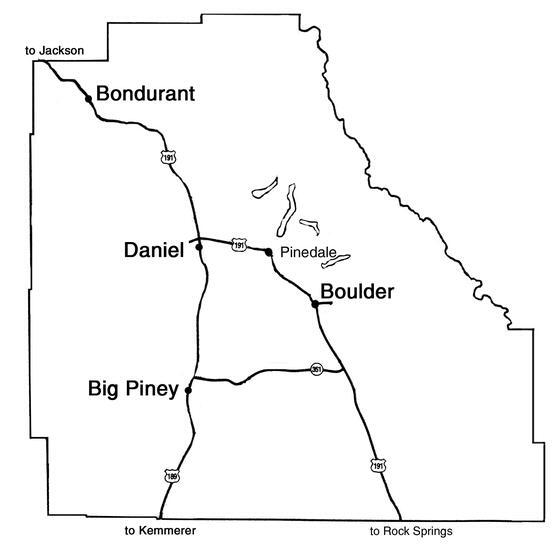 Larger schools were built at Big Piney, Pinedale (the county seat), and in the smaller communities of Boulder, Calpet and Daniel. The Daniel school is representative of this second stage of educational development in the region. Although a modest facility, it represented a substantial physical improvement over the one-room log school that it replaced. Daniel Community Center in 2001. The School is a large, wood frame, one-story building, 28' x 56'. With building materials from the Big Piney Lumber and Supply Company, the construction was finished in October. It appears to have been built from an architectural plan book provided by the school district, and the local contractor constructed the building to these specifications. The standard school plan is reflected in the high ceilings and relatively large floor space, a cloakroom, and large multi-paned banks of windows set high in the walls of opposite elevations. Although Daniel had a population of less than 100 people in 1920, the School Board of Directors advertised for sealed bids in the Big Piney Examiner for the construction of a new school at Daniel in July 1920. The board members were E.D. Key, C.F. Webb and Harold Munn. The advertisement called for the building of a frame schoolhouse measuring 28 x 56 feet with two rooms, a shingled roof, lathed and plastered on the interior, a brick chimney, and a cement foundation. The announcement also stated that the plans could be seen by prospective bidders at E.D. Key's store in Daniel. The Daniel community wholeheartedly backed the building of the new school. A box supper was held in September, and a large sum of money was raised to purchase desks for the school, still under construction. In the school year of 1921-1922 a musical party was held at the school in March in order to raise money to pay for what was still owed on a piano bought for the school. The orchestra, directed by Daniel storekeeper Elwood W. Albert, had a piano, trombone, comb, coronet, drum, flute, and cymbals. Activities in other years included a birdhouse contest, spelling contests, dances, track meets, a health club, art programs, and school plays and singing programs. Courses taught included arithmetic, reading, penmanship, spelling, poems, short story writing, vocal music, and musical instrument,. Athletic sports included broad jump, high jump, 50 & 100 yard dash, shot put, pole vault, and potato races. During the school year of 1929-1930, the school teacher for the Daniel School was Miss Madge McHugh, who had taught in Sublette County for several years. School began on September 9 and there were eleven pupils enrolled. Madge boarded with Mr. E. D. Key and his daughter, Beulah, at the beginning of the school year, then later moved to the Sargeant's Inn. At Christmas time, she went back home to Wisconsin to visit. When she returned, Sargeant's Inn had closed, so she spent the rest of the school yeaar at the Joseph Huston home. To begin the school year, Madge took the children on a wiener and marshmallow roast in the willows along Prairie Creek. Madge later married Jack Funk in Salt Lake City, Utah in 1941. She lived the rest of her life in Pinedale where she became almost legendary contributing her boundless energy to community events and activities that involved children. Madge's small log cabin was located just off Pine Street and north Tyler, behind Moosely Books until she died. The cabin is now located on the grounds of the Museum of the Mountain Man. During the school years of 1927-1928 and 1931-1932, school children in Daniel was taught by Mary Scott. After coming to the Sublette County area as an early teacher, she married pioneer rancher Harve Scott in 1912. His death in 1940 ended her teaching career, and she went on to become a Wyoming historian with a special interest for the Oregon Trail and authored a book entitiled, The Oregon Trail. She died in 1961 and is buried in Pinedale. 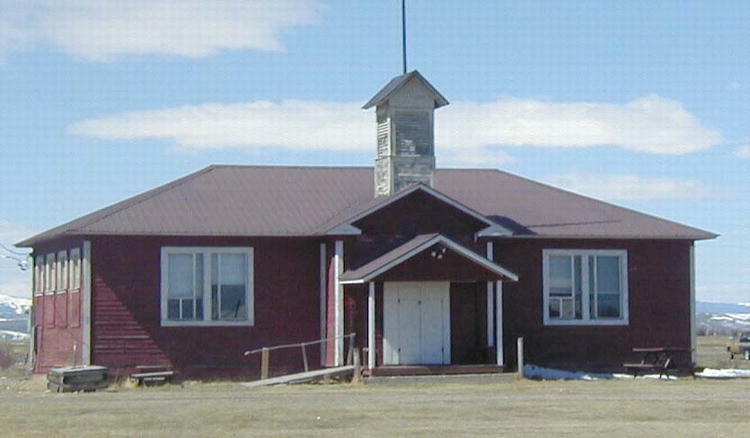 The Daniel School was one of only four rural schools in Sublette County to meet state requirements for standard schools (Big Piney and Pinedale also met the requirements, but were considered urban schools.) In 1938, Jerome Deveraux, superintendent of District Nine Schools in and around Big Piney, conducted a survey of rural schools in Sublette County for his Master's thesis from the University of Wyoming using statistics gathered in 1936. At that time, the Daniel School and its equipment scored 275 out of a possible 475 points on an official score sheet for rural schools. It ranked only second to Calpet in total points for rural school buildings and equipment. At the time of the survey, the Daniel School had twenty pupils' desks, two teachers' desks, blackboards, a library, a coal stove for heat, individual drinking cups for water, artificial lights, and swings and seesaws in a fenced playground. The building had an estimated value of $1500, $100 worth of furniture, and $250 worth of books. Although these attributes seem quite modest, many of them were absent from most of the rural schools of Sublette County, even at this late date. The typical pupil outside of Big Piney and Pinedale still attended a one-room log school building with less than 12 students. During the 1920s and early 1930s, it appears that only grades one through eight were taught. In the late 1930s, grades nine and ten were added. Consolidation brought an end to the Daniel School. Daniel had been a part of District No. 8. This was the first school district to be eliminated in the earliest serious attempt at consolidation in Sublette County. Starting with the 1939-1940 school year, District No. 8 was incorporated into District No. 1, and Daniel pupils were transported to Pinedale for classes. The Daniel School stood abandoned for years until the Daniel Homemaker Club, or Daniel Do Mores, acquired it. This community organization repaired and remodeled the building. The interior of the Daniel School was divided into two rooms by a moveable partition and was easily converted to one large room for social functions. The building is situated facing east on a concrete foundation. It has a medium hip roof with a boxed cornice and is surfaced with wood shingles. The exterior walls are covered with narrow clapboard siding and cornerboards. There is a shallow gable-roofed closed porch centered in the east with twin wood paneled doors that form the main entrance. The closed porch once enclosed the cloakroom where the students hung their coats and stored their lunches. There is a tall rectangular bell tower with wood louvres and capped with a wood spire centered over the closed porch and entrance. The bell is still in place in the bell tower. There are two separate wood frame outhouses, each 4.7' square, for boys and girls located about fifteen feet west of the southwest corner of the school. Each has a gable roof covered with tarpaper and clapboard siding and cornerboards. A well with the original hand pump also remains on a raised platform on the east side of the school. A gable-roofed open porch was added to the east side of the closed porch sometime after 1973. This is the only significant exterior alteration from the original design. The roof of the open porch is surfaced with wood shingles and is supported with thin square wooden columns. It has a wood deck, and a single concrete step leads to the deck level. The school originally had wood frame rectangular six over six-light double-hung windows. The window openings remain the same, but the windows have been changed to accommodate fixed units with large plate glass lights and aluminum frames. The building was used as the Daniel school from 1920 to 1939 when the School District #8 (Daniel) was combined with School District #1 (Pinedale) and the students were bused to Pinedale. In 1956, the building was deeded to the Daniel Homemaker's Club and is now owned by the Daniel Community Center. It was placed on the National Register of Historic Places in 1990. The structure has only had minor changes and looks much the same as it did in 1920. An open extension was added to the original closed front porch. Interior paneling and a lower false ceiling with new lights were added in 1974. In the process, the north window were covered and the south windows altered to accommodate kitchen cabinets. Finally, bathrooms and a new bell were added in 2001. The original hardwood floor has been retained along with some of the original trim and wooden baseboards. A portion of the original blackboards remains on the west wall. The schoolyard lot is not fenced and there is no playground equipment. Historic photographs show that the Daniel School retains a high degree of physical integrity and has received only minor exterior alterations. The building was originally painted white. 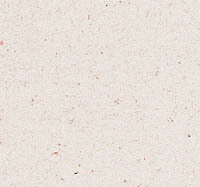 Currently, it is painted dark red with white trim. Today, the nearest buildings are residences over two hundred feet to the south and four hundred feet to the north. The land to the west is fenced as pasture and hay meadows, affording an unobstructed view of the distant snow-covered peaks of the Wyoming and Gros Ventre mountain ranges. The northern portion of the Wind River mountain range is also clearly visible to the north and northeast. The site is treeless with sagebrush growing in untended areas on the perimeters of the schoolyard. Thick growths of willow bushes line the banks of Prairie Creek to the north. The School is located approximately 1,000 feet west of US Hwy 189, the principal route that also forms the main street of Daniel. The Daniel School is used today for many community events and activities including wedding receptions, elections, and funeral receptions. At least one Pinedale elementary teacher used to take her students on field trips to the Daniel School and hold classes there to give them a one-room school experience of a bygone era. The Aniel Daniel Chili Cookoff, first held at the Green River Bar in 1982, is now held the first weekend in April at the Daniel School. The Old Timers' Picnic, first held at the David Ranch in 1980, is now held the third Sunday in July each year at the Daniel School. This web page is the companion of a brochure sponsored by the Sublette County Historic Preservation Board that highlights four historic community buildings within Sublette County. Brochure and web site created by Wind River Web Services and Sublette.com in Pinedale, Wyoming. "The Daniel Community Center", Daniel Wyoming: The First 100 Years 1900-2000, Daniel Community Center, 2000. "Danial Area Schools", Daniel Wyoming: The First 100 Years 1900-2000, Hayden Huston, Daniel Community Center, 2000. Daniel School 48SU949, National Register of Historic Places Registration Form, September 1990. 2001 Daniel School House Photo by Wind River Web Services. www.wrws.com. This project was financed in part with funds granted to the Sublette County Historic Preservation Board from the National Park Service, U.S. Department of Interior. The Wyoming State Historic Preservation Office administers these federal funds as part of Wyoming's Certified Local Government program. This program receives Federal financial assistance for identification and protection of historic properties. The contents and opinions do not necessarily reflect the views or policies of the Department of the Interior. Under Title VI of the Civil Rights Act of 1964, Section 504 of the Rehabilitation Act of 1973, and the Age Discrimination Act of 1975, as amended, the U. S. Department of the Interior prohibits discrimination on the basis of race, color, national origin, handicap or age in its federally assisted programs. If you believe you have been discriminated against in any program, activity, or facility as described above, or if you desire further information, please write to: Office of Equal Employment Opportunity, National Park Service, P.O. Box 37127, Washington, D.C. 20013-7127.